Amwell Rotarians believe that young people should be encouraged to grow and develop - in order that they are able to reach their full potential and thus become responsible and caring members of their local communities. As a Rotary Club, we support various initiatives in pursuit of this ideal. On this page you will find a few brief details that outline some of the recent projects that we have undertaken. 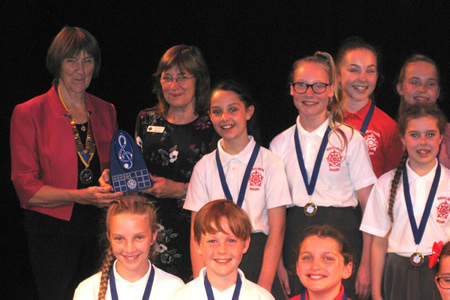 First held in 2015, Amwell Rotary’s School Choir Competition received such an enthusiastic response from local schools that it became an annual event with the 2018 competition finals concert being held at The Spotlight (Formerly Broxbourne Civic Hall) on Thursday May 24th 2018. The competition provides a lot of fun for the participants and it is hoped that performing in public will inspire all those taking part to continue with their musical interests. Amwell Rotary is very grateful for the support given by Hertfordshire College of Music, both financial and technical. All proceeds from the competition go to Rotary supported charities. 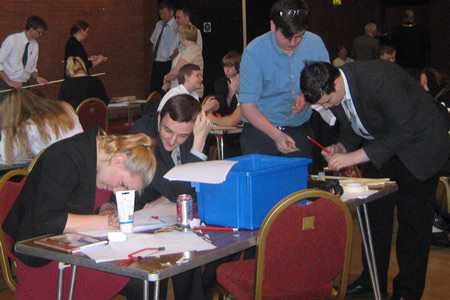 Each year, Amwell Rotary Club joins with colleagues from the four other local Rotary Clubs to assist with the Annual Schools Technology Tournament organised by Hoddesdon Rotary Club. Over the years, Amwell Rotary Club have sponsored many teenagers and young adults to attend one of these Youth Leadership training weekends held at RAF Henlow in conjunction with the RAF. An extremely demanding schedule stretches all of the participants to their maximum potential both physically and mentally. It’s tough, very tough – and most of those taking part have told us afterwards that they were often left wondering just what exactly it was that they had managed to get themselves into. However, they have all also gone on to say how valuable the experience was in terms of personal development and for their future careers. Each year, Amwell Rotary Club awards a number of small bursaries to local youngsters who have shown particular potential or ability in fields such as sport, the arts or music but who may be struggling to meet the additional costs of extra tuition, enrolment fees and the like. We are looking for young people who live in our local area who want to make the most of their talents or skills, young people who are committed and enthusiastic about their sport, their art or their music and who could use some extra help to achieve their goals. Amwell Rotary Club draws its membership from Ware, Hertford, Hoddesdon and Broxbourne, as well as many of the surrounding small villages. If you feel that you might qualify and can demonstrate your determination then we would like to hear from you. In the first instance, please CONTACT us to request an application form. Previous recipients have played the trumpet and played the piano, played badminton, swam, cycled, kayaked, acted and danced - among other things. Many of them have gone on to achieve notable success in their chosen field. Interact is Rotary International's service club for young people ages 12 to 18.